Here, soon, I will be featuring all of my Dark Age DBA armies - as well as a number of individual figures in my collection for skirmishing, etc. Check back after the end of February, I should have every thing completed by then! This is a Welsh 580-1099 DBA Army (III/19a). The complete army - with all options. 2x Psiloi - for skirmishing and harassing. 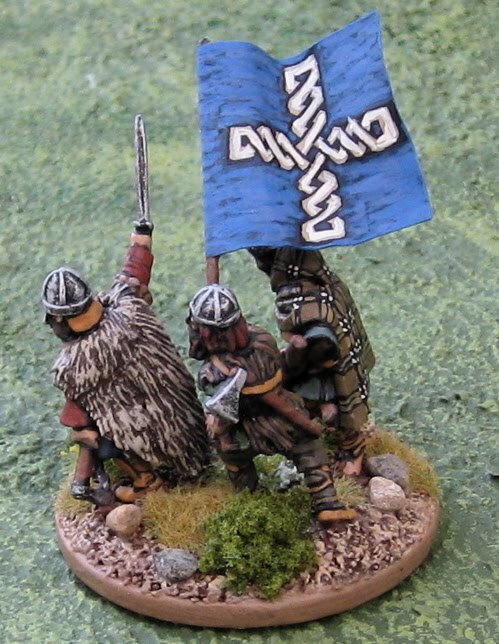 This is my Army Marker for the the Welsh DBA army (for marking the movements of the armies on the campaign map). 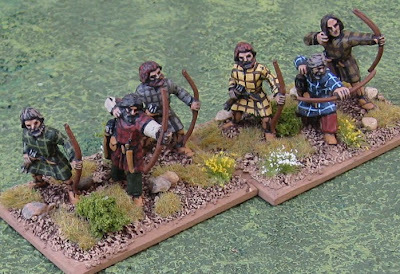 I actually painted up an extra “warband” and an extra psiloi (not pictured here) – this is to cover parts of the later lists (III/19b and III/19c Welsh 1100–1420 – South and North, respectively). I also have a PILE of archers to paint up as the III/19b (South) list has 8 stands of Long Bow. 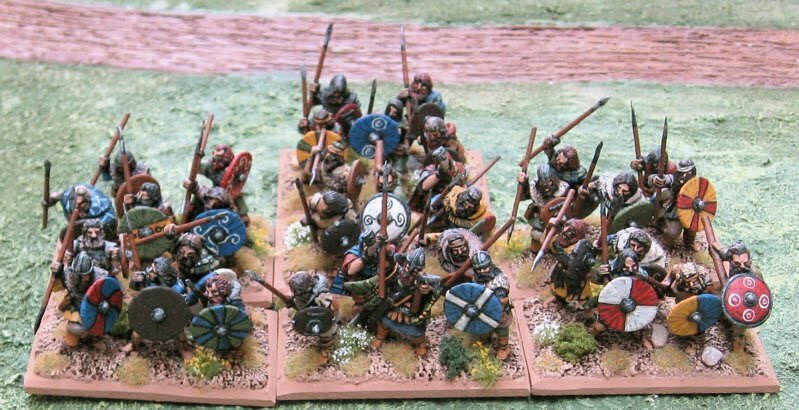 Also I’ve done all these "warbands" with spears as the III/19c (North) list no longer has Warband but 8 Spear (with the option of three more – or three bow, or three psiloi). 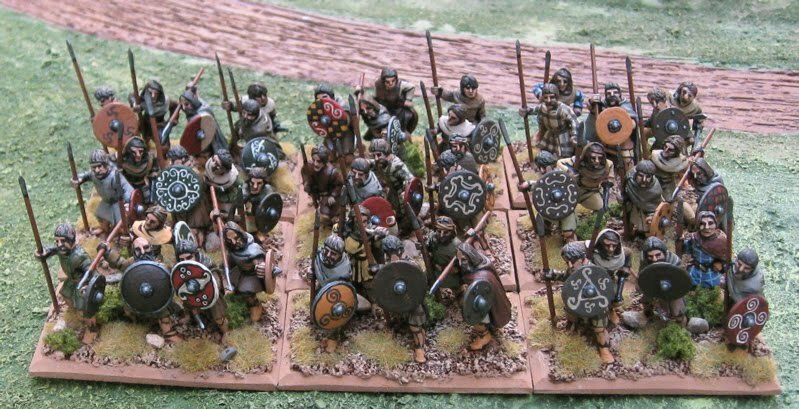 This is the whole army with all options. 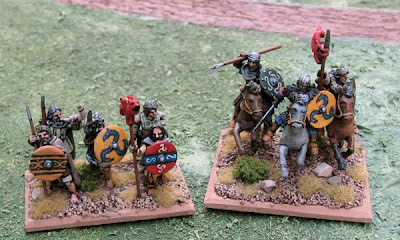 The General options - Cavalry or Warband. 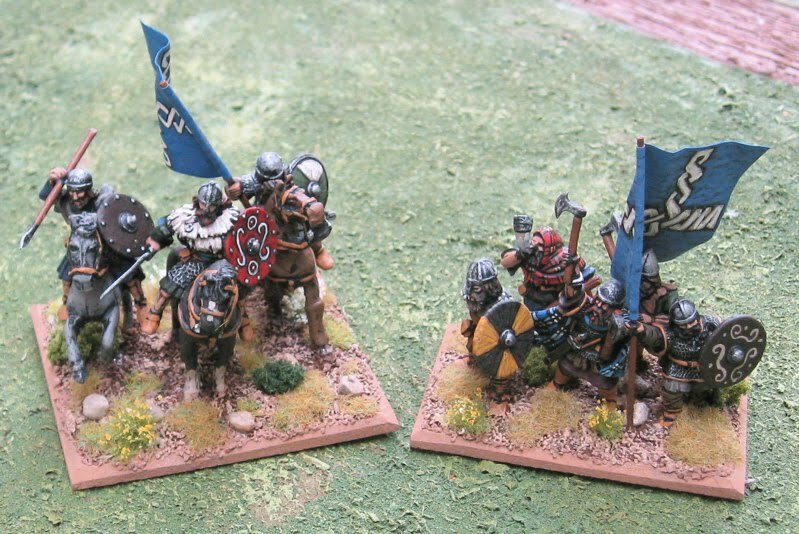 There is a requirement for one Warband (4Wb) and an option for another two (3Wb) - as they make no difference in DBA, I've based them all the same. All these figures are from Old Glory or Gripping Beast. 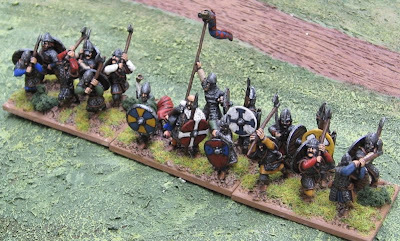 This force is meant to be fielded as wither Middle Anglo-Saxons (III/24b 701-1014AD) or Anglo-Danish (III/71 1014-1075). There is very little difference between the two. 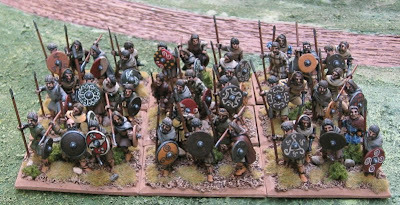 This is the Anglo-Danish army with all options: Blade General, two other Blade, eight or nine Spear and an optional Psiloi. 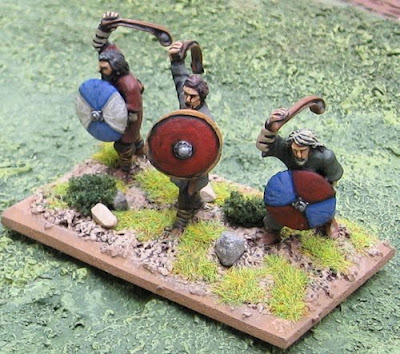 The Spear General element for the Middle Anglo-Saxons – I put lots of spears on here to remind myself that they’re not Blade!! 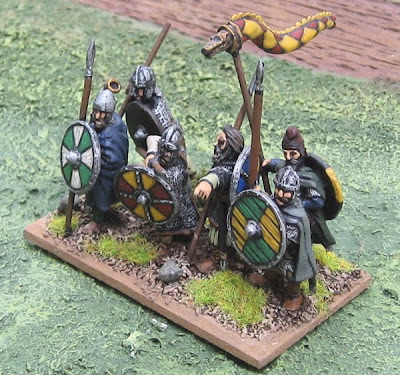 General Element and Huscarls for the Anglo-Danish (all Blade). 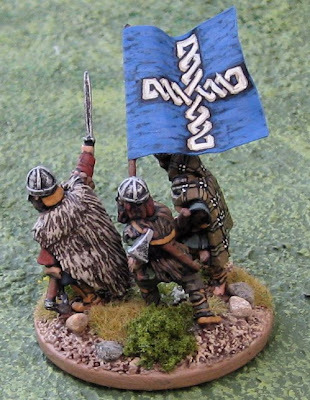 This General stand also has spears to remind myself that this is the General for the Anglo-Danish I painted the Generals shield to look like a modern Danish flag. 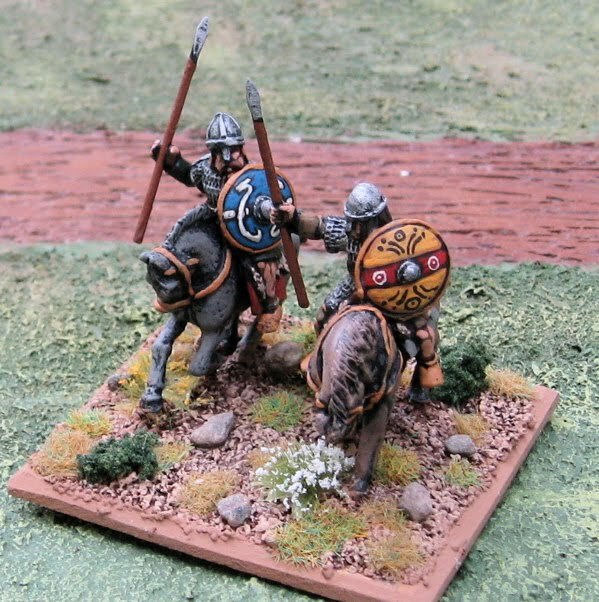 The bulk of both armies – the English Spearmen. Skirmishing Psiloi – optional in the Anglo-Danish army, required in the Middle Anglo-Saxon. Optional Horde for the Middle Anglo-Saxons. I’ve never used them. 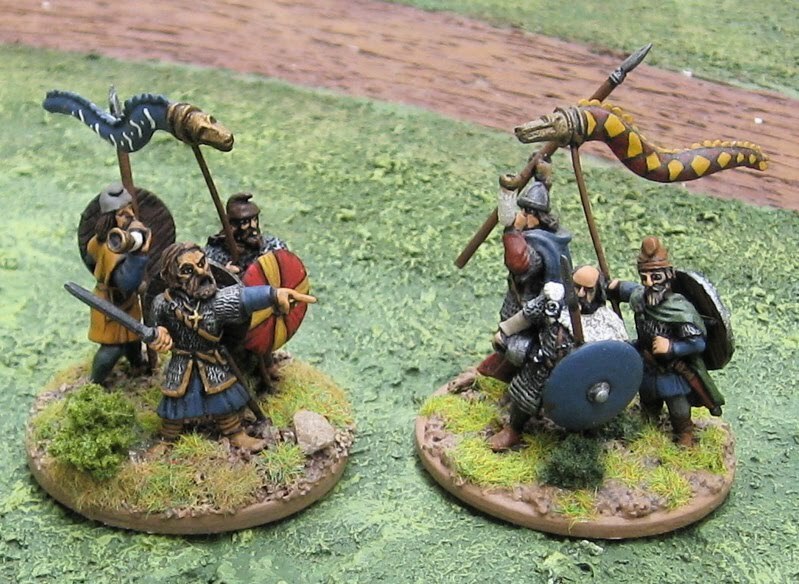 I probably never will, but to be a completist I made the two stands out of some very old home-cast figures that I’d used to make my previous Anglo-Saxon/Danish army (I think this was the very first figure I ever modeled and cast!). 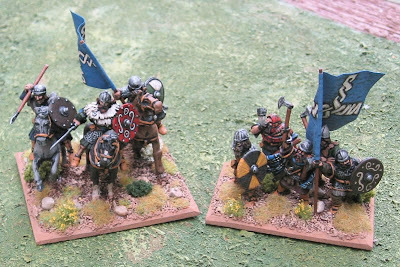 These are a couple of extra stands I made as options for when the army is fielded in Hordes of the Things: Shooters and Clerics. If I took the Cleric (which is 3AP) I would also take a Horde (1AP) to make the army point total even. These are Army Markers for marking the location of the army on a campaign map. 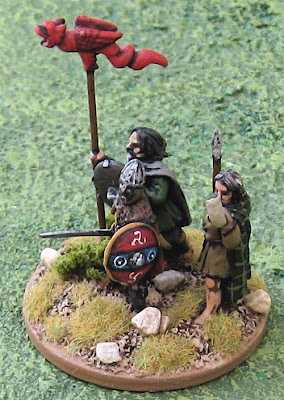 Most of these figures are from Old Glory and Gripping Beast, and there are a handful from Black Tree Design as well as a few I modeled and cast myself. I have the beginnings of a SECOND English army – the Blade and Psiloi elements and a four Spear elements made up of those home-cast figures I used for the Horde in this army. 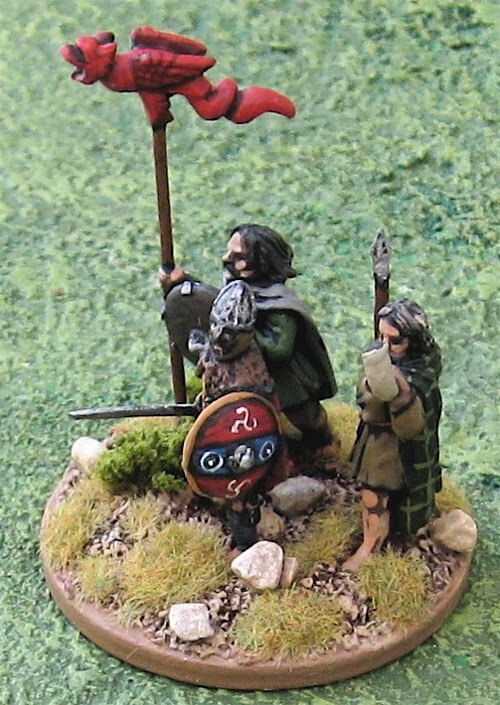 At some point I thought I’d model a new generic Dark Age spearman – with a bigger shield (or separate shield)! Then I’ll finish up the second army. Heck, I could even do a third… or fourth… but that might be a bit Silly!